Are you on a super tight budget and could benefit from cheap car insurance no deposit? This is one great way to get a good price on insurance without having to worry about putting up money upfront. A nothing down policy means that you’ll have to pay for one extra month on your initial policy, but get the first month of coverage for free. It makes it possible for people low on funds to secure auto insurance. The reason you have to pay for the extra month is simple. Typically, paying a deposit on your insurance coverage is a form of collateral for the company itself. In the event you cannot pay for the rest of your coverage, the deposit is like a security measure that will pay out to the insurance company. Monthly premiums are actual payments that you make on loan, rather than a subscription to a service. What Exactly is No Deposit Auto Insurance? As the name implies, this is a type of auto insurance plan where you do not have to pay a deposit up front for coverage. Your first bill for one month of premiums will not include a charge for a down payment. Most insurance companies will offer a way for you to pay the deposit in smaller monthly plans or as a larger lump sum. Those who do charge for a deposit will charge up to 20% of the entire policy cost up front, by offering lump-sum payments. Fortunately, there are companies around the country that offer small monthly payment plans and no deposit. Of course, if you are able to pay for your insurance cost upfront, in one lump sum, then you likely will not have to pay for a deposit. However, most customers choose to pay for their coverage with smaller monthly charges. This way they can afford to get covered and not pay out a huge amount all at once. There are many ways to save money. Stay longer with us to go higher in our loyalty program. Get more discounts!. Several discounts are Instant and can save you a lot (i.e. student, reliable driver, and homeowner). Why Buy Cheap Auto Insurance With Nothing Down? There are some helpful, cheap insurance plans out there that allow you to pay off your deposit over the monthly payment plan, rather than having to pay it up front. Most companies will work out a larger lump sum deal, where you pay off the deposit once every three months instead. There are even coverage plans that allow you to pay as you go, which is a great option if you are struggling with a bad credit rating. Plus, you have the option of finding an insurance plan that specializes in working with low-budget customers. There are always sources to find online that can lead you to a carrier that offers these deals. Some down payments are as low as $20, which makes buying auto insurance affordable for almost everyone. Other companies don’t have a down payment at all, meaning you have an entire month of coverage without needing to make a payment. This is preferred for those on a very tight budget. Teenagers who purchase auto insurance plans will, unfortunately, pay some of the highest rates across the board. Teens are naturally a higher risk, meaning they are expected to shell out more for their premiums. However, getting a policy with a lower down payment charge makes it more affordable. There are carriers that offer programs to drivers under 25 that start at $50 down. It’s important to note that not all young drivers will qualify. If someone has a bad driving record or no credit, a higher deposit may be required. What are the Best Payment Plans? When you purchase an auto insurance plan that does not require a deposit, there are several things you should take into consideration. The insurance company you apply with will have to approve the payment of the deposit on a monthly plan upfront. One of the most important pieces of advice we can give you is to make sure to pay off your monthly deposit the month before it is due. That way, it will give you the security that your coverage is ensured. It also speaks of good spending habits to the insurance company, who may lower your premiums in the future. So, for example, you will want to pay off your June amount in May. This way you will be covered for all of June without needing to worry about the status of your policy. If you have an unexpected accident or emergency, you’ll be glad that your insurance was covered that month. It’s extremely vital that you find an insurance company that you can trust. Ensure that the company you signed up with can respond and push your payments through on time. If they fail to check your deposits before the due date, it’s a red flag that the company is no good. Make sure you are on top of your company when it comes to the processing of your payment. What Can Affect The Cost of Your Insurance? Some companies may place more weight on certain factors than others. It’s important to know that there are many ways a provider can determine your rate. Which Insurance Companies Offer No Deposit Plans? 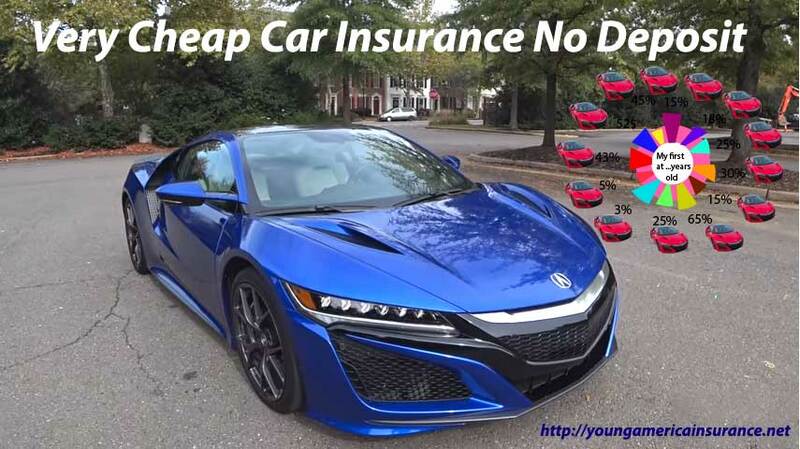 There are several well-known auto insurance companies that you can rely on when you’re looking for affordable, zero down car insurance plans. The two biggest carriers, GEICO, and Progressive Insurance, offer several of these plans. You can also apply and buy a policy online. Depending on where you live, there may be local insurance providers that offer free or very cheap car insurance no deposit plan. Some carriers will offer an insurance plan including the first month free. These special zero deposit plans are great for those who are very limited financially, but you have to qualify for them first. Typically, you need a good credit score and a decent driving record up front. There are some drawbacks to this kind of plan as well, however. Unfortunately, it does not work for everyone. There are a few things you need to be aware of before you invest in this kind of plan. Is it Worth Getting a No Deposit Plan? Absolutely yes, for several reasons. It’s worth it to look into cheap car insurance no deposit. There are plenty of huge advantages. If you have very little savings but still need auto insurance, it can be a lifesaver. You’ll then have the opportunity to save for a month and later make simple installment payments. It also helps if you are actively working to improve your driving record and credit score. Now, you can get the same great coverage while paying low, consistent monthly rates. In the future, you may even receive a discount for your car insurance once your driving record and credit improves. The best way to get cheap car insurance no deposit is online. You can search for custom plans that offer zero down, $20 down and $50 down plans. You will be matched with multiple competing insurers that will offer their best rates. Look for quality national carriers that have the lowest deposit and cheapest premiums. Once you find a company and plan you like, finally you can buy a policy direct. You can always learn more about cheap car insurance no deposit before making your mind up. Apply now for a free quote and get the cheap car insurance no deposit coverage you need for less.